A Glasgow-based artist is the first winner of a new international award. Cathy Wilkes, who was nominated for the Turner Prize in 2008, has been awarded the Maria Lassnig Prize for mid-career artists at a ceremony in New York. As part of her prize her work will be on display in New York until March, in a solo exhibition at PS1, a satellite gallery of the Museum of Modern Art. The 50,000 Euro (£45,000) award is named after the late Austrian artist Maria Lassnig. Ms Wilkes, who was born in Belfast, is one of 42 artists who work with The Modern Institute in Glasgow and has been involved with the commercial gallery since it opened 20 years ago. "People are very happy about it [the prize]," said Toby Webster, founding director of the gallery. "To be honoured by someone like Maria Lassnig is big, it's important, it shows Cathy's seriousness and respect." "To be given a solo show at PS1 is prestigious and unusual for a European artist. It will open her work up to a lot more people," he continued. 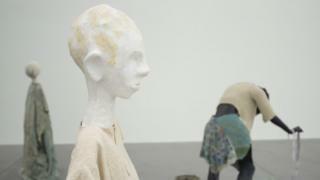 "Cathy Wilkes is a deserving winner," said Sarah Munro, chair of Scottish Contemporary Art Network. "The structures of the art world often make it difficult for women artists to maintain their visibility and status mid-life or mid-career. "It is exciting to think about what this opportunity means not just for Cathy but for the New York audiences who will get to see more of her unique and deeply committed art." The contemporary artist, who trained at Glasgow School of Art in the 1980s, draws on everyday objects from her life in the city to create her work. "Cathy's work has to do with being alive, the here and the now," said Toby Webster. "It's very much to do with her position being a mother, with life and death, and emotions. It crosses almost every language. "She transforms the humblest of materials, such as worn textiles and old ceramics, into moving tableau," said Sarah Munro, who is also the director of Baltic Centre for Contemporary Art. "Her work has, from her early days as a feminist artist and activist, focused on the immediacy of real life and often unspoken experiences such as loss, care and parenthood," she said. Since the early 1990s, Ms Wilkes has had her art displayed in galleries around the world, including in Berlin, Chicago and Brussels. The exhibition in New York is her largest yet. About 50 artworks created over the last 13 years are on display, including some pieces created just for the PS1 gallery showing. The Maria Lassnig prize was set up in 2016 and will be awarded every two years.